Luton bowed out of the Carabao Cup with a narrow 1-0 defeat at Championship outfit West Bromwich Albion this evening. For long periods, the Hatters performed valiantly, more than matching their hosts, until Oliver Burke's goal just after the hour mark proved the difference. Town boss Nathan Jones made eight changes, giving a full debut to Sonny Bradley, as only West Brom target Jack Stacey, Pelly-Ruddock Mpanzu and Matty Pearson remained from the side who drew 1-1 with Sunderland. There was a surprise place on the bench for midfielder Luke Berry though, coming just 137 days after he suffered that terrible injury against Colchester last season. Darren Moore went with a strong Albion too, internationals Hal Robson-Kanu, James Morrison, Ahmed Hegazi and Matt Phillips all in from the word go. Luke Gambin had the ball in the net inside the opening two minutes, only for Jake Jervis to be flagged offside in the build up as Hatters acquitted themselves excellently in the opening forays, Bradley's header easy for Boaz Myhill. Luton then fashioned a great opportunity on 25 minutes, when James Justin's clever low ball picked out Jervis, who turned his man, but from just inside the box, dragged a left-footer disappointingly wide. The hosts responded with a first moment of real quality, Phillips cutting in from the flank and sliding in Robson-Kanu, who avoided Pearson's challenge only to see James Shea make an excellent save. Almost spurred on by Jervis' miss, the Baggies went close once more on 25 minutes, Phillips, who was having more and more of an influence, sending over an inviting cross that Robson-Kanu glanced wide. Town, with Mpanzu once again driving them on from deep, relishing the chance to show his pace, power and new found control on the bigger stage, had another chance, the midfielder's chest attempt tipped behind by Myhill. Shea had an easier stop on 37 minutes, Robson-Kanu's 20-yarder never seriously troubling him, while he had no issues with Harvey Barnes' ambitious 30-yard sidefoot either. Robson-Kanu continued his frustrating personal evening, glancing off target from four yards after being found by Burke's penetrating run and cross. Harry Cornick dragged across the face on the stroke of half time, while the second period saw the Baggles clearly with the momentum, making all the running, although Luton went closest, Pearson heading Andrew Shinnie's corner over at the back post. The deadlock was finally broken on 62 minutes, when a fortunate deflection saw the ball ricochet perfectly for Burke who bore down on Shea before slotting into the net. Hatters responded by bringing on Lloyd Jones and then Elliot Lee, but barring Glen Rea's unlikely effort from range, they never seriously threatened forcing penalties. With five to go, the biggest cheer of the night erupted from the nearly 1,200 noisy travelling supporters as Berry came on for Rea, to complete his startling recovery. Shea had to beat away a late Morrison piledriver as the visitors forced two late corners, only to see the Baggies stand firm to reach round two. Baggies: Boaz Myhill, Hal Robson-Kanu, James Morrison (C), Matt Phillips (Kyle Bartley 46), Conor Townsend, Harvey Barnes (Jonathan Leko 66), Oliver Burke, Tosin Adarabioyo, Ahmed Hegazi (Kyle Edwards 46), Sam Field, Rekeem Harper. Subs not used: Jonathan Bond, Jake Livermore, Dwight Gayle, Jay Rodriguez. 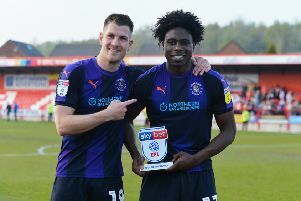 Hatters: James Shea, Jack Stacey, James Justin, Sonny Bradley, Matty Pearson, Glen Rea (C Luke Berry 85), Pelly-Ruddock Mpanzu, Luke Gambin (Lloyd Jones 64), Andrew Shinnie (Elliot Lee 75) Jake Jervis, Harry Cornick. Subs not used: Marek Stech, James Collins, Jack Senior, Arthur Read. Attendance: 10,404 (1,175 from Luton).